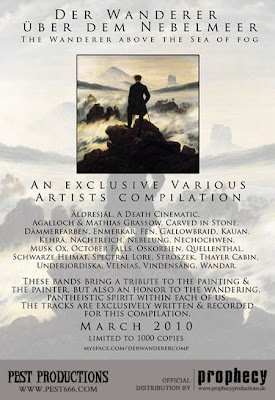 This is a breathtaking compilation of amazing music, and it was put together by HSS friend Niels of Sequences. 2 CDs of absolutely beautiful music. "These bands bring a tribute to the painting and the painter, but also an honor to the wandering pantheistic spirit within each of us. The tracks are exclusively written and recorded for this compilation." This gets my absolute highest recommendation. Get it now here. Many thanks to Niels for shouldering the burden and finally getting this out. I come at this from the perspective of someone who is just listening to the music, but dude - from my angle, at least, it seems as if all the work you put into this paid off big-time. Prophecy Productions should have copies for sale aswell really soon (1 - 2 weeks). I've got also a few copies for sale for people that want to order from Europe. I was entertained and enjoyed it, but I wouldn't say that it blew me away. The Nechochwen and Gallowbraid songs blew me away, but overall no.